The first Labor Day with a new President delivers good news, no news, and bad news for unions and America’s workers. The good news, according to a new Pew Research Center survey, six-in-ten (61%) adults today have a favorable view of labor unions. That’s a big jump from March 2015, when less than half of adults (48%) expressed a positive view of unions. More good news, young people are far more likely than older adults to view labor unions favorably, with three quarters of those ages 18 to 29 say they have a favorable opinion of labor unions. Immigrants, minorities, and people of color are also drawn to unions. However, it’s no news that Republicans and Democrats have opposite views on labor unions. That’s the case today with Democrats largely pro-union, while just the opposite is true for Republicans and those leaning Republican who are agitating for state right-to-work laws. The bad news comes from an upcoming U.S. Supreme Court case called Janus V. AFSCME, which could result in a nationwide right-to-work law. Janus is a carbon-copy of the Friedrichs case which was designed to cripple unions. It failed only due to the death of Supreme Court Justice Antonin Scalia. With a Presidential appointment unfairly denied to President Obama now on the high court, the case seems destined to strike down 40 years of settled law. We will know next summer. In anticipation of this right-to-work “victory” anti-union front organizations are committed to “defund and dismantle unions”. Leading this national effort is the Milwaukee-based Lynde and Harry Bradley Foundation. The Bradley Foundation and the National Right to Work Legal Defense Foundation are pouring money into a coordinated attack on public employee unions in particular – because they are the “foot soldiers of the Democratic party”. But here is the hopeful news. Ohio Council 8 and our national union are AFSCME Strong and we have proven “we never quit”. 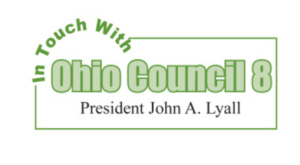 We have dramatically increased our Ohio Council 8 and national membership by organizing new unions and educating our fair-share fee payers about the value the union brings to their work and home life. Finally, let me say that AFSCME has always been an early responder in times of crisis in our communities, donating and distributing emergency supplies and raising money for those in need. This Labor Day is a time to reflect on who we are as a union. Our job isn’t just to organize members, bargain contracts and protect our members. It’s also our job to bring respect and dignity to all working people. That means being there when we are needed. I ask that you do what you can for your union brothers and sisters in Texas affected by the natural disaster still unfolding across the Gulf coast. A good way to start is to visit the AFSCME web page, where you can make donations that will help those in need after the devastation of hurricane Harvey. On behalf of the AFSCME Ohio Council 8 Executive Board and First Vice President Harold Mitchell, I wish you all a safe and enjoyable Labor Day with your families and friends.